"A resident of Shishmaref, Alaska, visited his sister's grave on the 17th anniversary of her death. 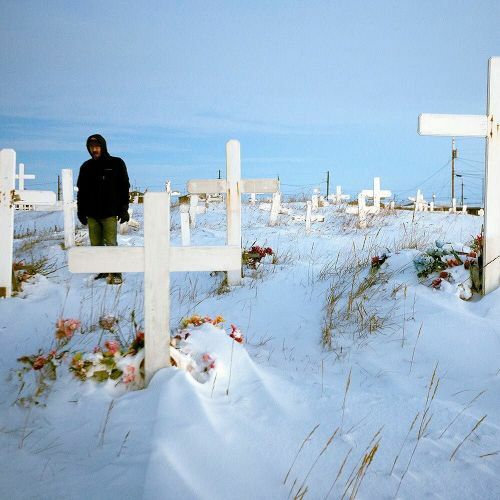 The cemetery is centrally located, in front of the Lutheran church — the only church in the Inupiat village, which is home to some 600 residents. As rising temperatures melt sea ice and thaw permafrost along the coast, Shishmaref faces the immediate threat of inundation. Villagers were so alarmed by the rising tides that in 2002 they voted overwhelmingly in favor of relocation. Yet few have budged. "They have their own culture and art," said @nimataradjiphoto, who traveled to Shishmaref to photograph the effects of #climatechange on the community. "All this is threatened by the fact that their home will disappear in a near future." This #nytweekender, we're sharing @nimataradjiphoto's photos from Shishmaref. Visit the link in our profile to see more of his work on the #LensBlog." By nytimes on Instagram.